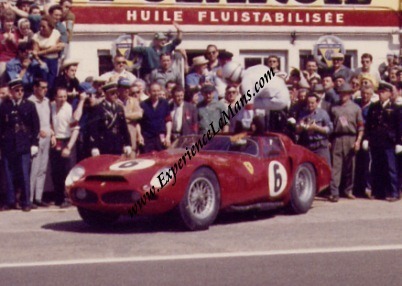 Vintage 1962 COLOR photo of Ferrari 330 TRI LM S/N 0808 at the 24 Hours of Le Mans 1962. 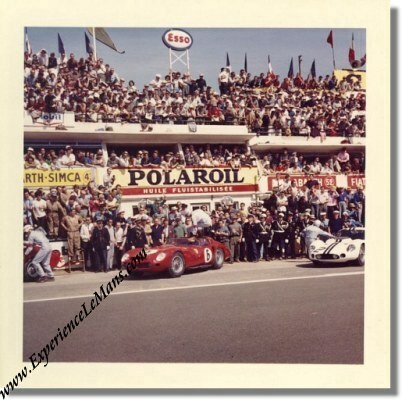 This is a vintage 1962 colour photo of the factory entered Ferrari 330 TRI LM of Olivier Gendebien and Phil Hill at the very start of the 1962 running of the 24 Heures du Mans which they would win. In the photo, we see the VERY start of the race where Phil Hill makes an athletic jump into the car so it was taken at 4 o'clock in the afternoon of June 23, 1962. The car, which bears race number 6 here is S/N 0808 (previously 0780TR, a 250 TR 60, which frame was lengthened, a Fantuzzi body was mounted and equipped with a 4 Liter 390 HP V12 engine) and which seems to reside in the USA now. The photo measures some 9 x 9 cm or 3.5 x 3.5 inches and carries the copyright stamp of L.R.P. For the full results of this race, please see 24 Heures du Mans results 1962.